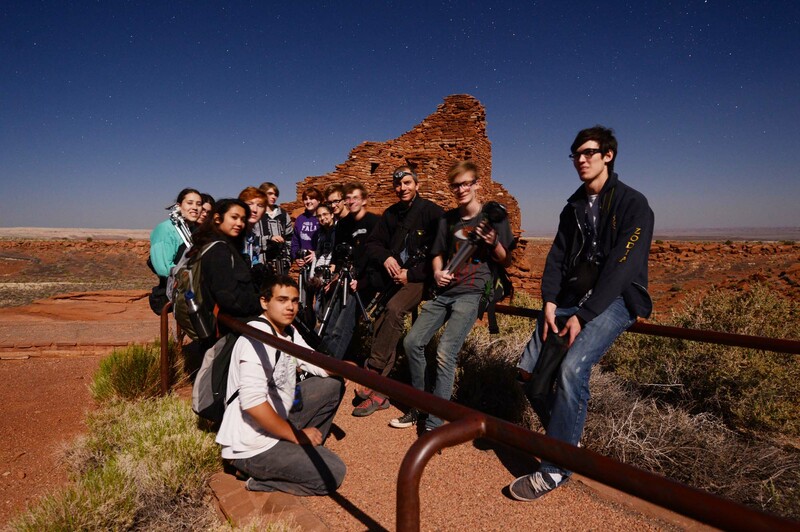 Had a visit from a group of enthusiastic photography students from the Flagstaff Arts and Leadership Academy (FALA) last night. Annabelle, Rene’s daughter, had come to the photo class Sunday night with her mother and a friend. 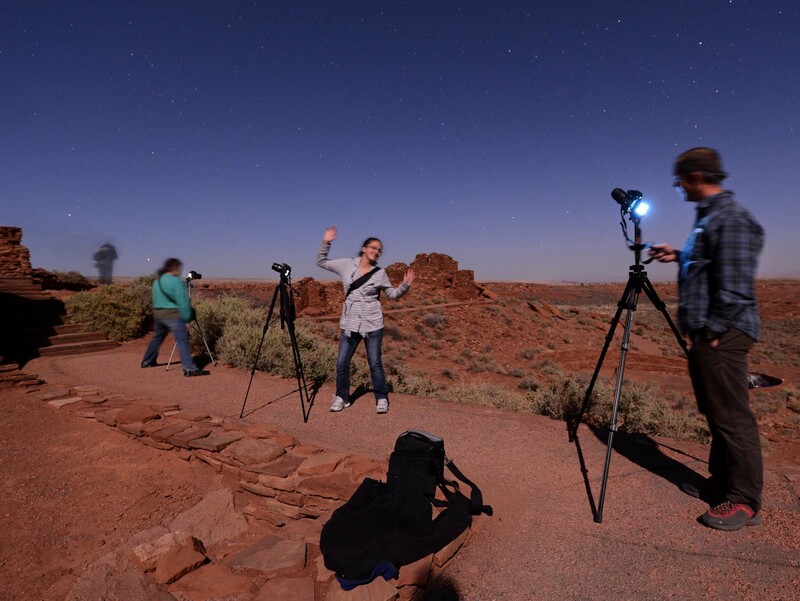 She got some good shots and showed them to Rich Kruger, her astronomy teacher the next day. He in turn wanted to bring some students out to have me teach them some night photo tips. 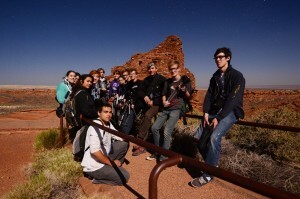 So 13 students from the photography class responded to the announcement of the trip up to Wupatki and arrived in 1 van and a car. 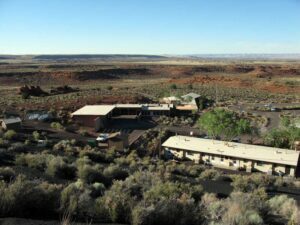 We headed down to the Wupatki site where the students fanned out around the structures. All came equipped with a digital SLR and a tripod. Right away they seemed to produce good photos. Several experimented with “light painting”, shining flashlights on the ruins or themselves during the long exposures. Rich was shooting all the constellations in the sky to show to his class. Several students seemed very advanced and it was nice to talk photo stuff with then. All had fun and wanted to return to Wupatki or do more night photography. At the end I took a group photo under the stars. Earlier in the afternoon I climbed up the hill behind the apartments, all the way to the top. It’s a tough exercise since the hill is very steep and for most of the way you are walking through volcanic cinders, similar to sand. You can get a cell phone signal from the top, which I was doing in case there were any last minute messages about the night class. It’s quite a climb for a cell signal. 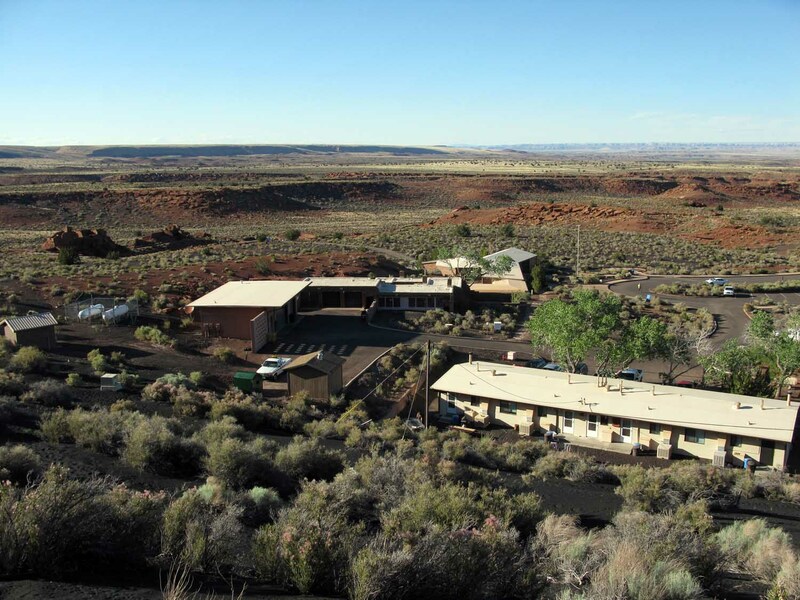 You do get quite a view from high up, I’ll include a photo of the visitor center complex and the desert vista that we see everyday.